The fiancee of Lee Rigby has told ITV's This Morning that she will take comfort from the life sentences given to the two men who killed him. “It’s definitely some sort of comfort to know that I’m never going to bump into them in the streets and that they’re never going to be out again," Aimee West said. She said Michael Adebolajo and Michael Adebowale scuffling with security guards in the dock yesterday rekindled some painful images. The family of Lee Rigby said "justice has been served" for the solider today as his murderers were jailed. 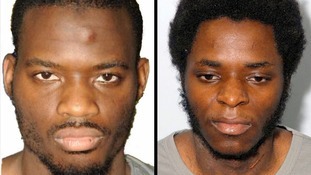 Lee Rigby's family said Michael Adebolajo and Michael Adebowale had received the "right prison terms" adding: "We feel satisfied that justice has been served for Lee." The struggle in the dock at the Old Bailey was triggered when Adebolajo and Adebowale - both wearing Islamic robes - reacted angrily to comments that Mr Justice Sweeney made about their extremist beliefs. He told them: "You each converted to Islam some years ago. Thereafter you were radicalised and each became an extremist, espousing views which, as has been said elsewhere, are a betrayal of Islam." Adebowale protested that this was a lie, ranting about America and Britain, and his accomplice joined in, screaming "allahu akbar" and hurling abuse at the prison guards who grappled him to the ground. Both men were grabbed around the face as guards struggled to control them, and taken down to the cells.The soldier's family were visibly distressed, and one relative needed medical treatment. Michael Adebolajo and Michael Adebowale revelled in one of the most appalling terrorist murders I have seen whilst head of counter terrorism at the CPS. Not only was the attack brutal and calculated, it was also designed to advance extremist views. As a solider, Fusilier Lee Rigby was targeted in a clear act of revenge, deliberately carried out in full view of members of the public for maximum impact. Under the law, terrorism is committed by a defined act designed to influence a Government, the public or an NGO for the purpose of advancing a religious, political, ideological or racial cause. This attack was always going to fail in that purpose as it served only to bring people together in shock, sympathy and solidarity. In December, the two defendants were convicted of a savage murder. Following strong argument from the prosecution, they have today been sentenced for carrying out that murder during an act of terrorism. I know the court process has been particularly distressing for Lee Rigby’s family. I hope they can take some small comfort from the sentences imposed today and can begin to move on. Three people were arrested outside the Old Bailey today as far-right protesters gathered ahead of the sentencing of the two men who murdered soldier Lee Rigby. Dozens of demonstrators gathered outside the court building, waving Union flags and chanting. A City of London Police spokesman said two men were arrested, one on suspicion of actual bodily harm and one for affray. A woman was arrested on suspicion of being drunk and disorderly. The police spokesman said there was a "significant police presence" in the area. The street has been closed in both directions outside the court.